The first doterra Essential Oil I tried was the On Guard blend. At the time, I had been prescribed three separate courses of antibiotics in the five months since my son was born. After my first baby, my daughter, was born I didn't really get sick and when I did I recovered pretty well. However, having an 18 month old in nursery and a newborn baby meant that the sickness bugs just seemed to circle in on us. The kids got over it pretty quickly, but I seemed to get it last and it would last for twice as long as it had for the kids. My husband seemed to miss all of it (lucky him) and I just went from week to week to week waiting for the next round of bugs to invade. Finally things started to be getting better. I'd given up gluten, was mostly eating Paleo and the bugs didn't seem to be making as regular an appearance. I'd even gone back to exercise, trying The Circuit Factory which had made more of a difference to my physical fitness than I had ever though possible. Although running outside in 45 degree heat and 80% humidity in the summer in Dubai is apparently a open invitation for the invasion of germs. I lasted about 8 weeks of exercise before I was struck down with bronchitis needing yet another course of antibiotics. If I'm completely honest, it was the final course of antibiotics which sent me in search of another answer. I was already subscribed to The Paleo Mama and had seen that she relied heavily on essential oils to support her family's immune systems. It seemed massively too good to be true. Something natural, with no side effects, that could support the body and help it to naturally fight off infections. I was also beginning to get concerned about becoming resistant to antibiotics. Four courses in less than six months can't be helping my immune system or my digestive system either. So I signed up to Doterra as a "Wellness Advocate". At the time it was merely a way to save 25% on the essential oils, rather than a real plan to actually sell essential oils. 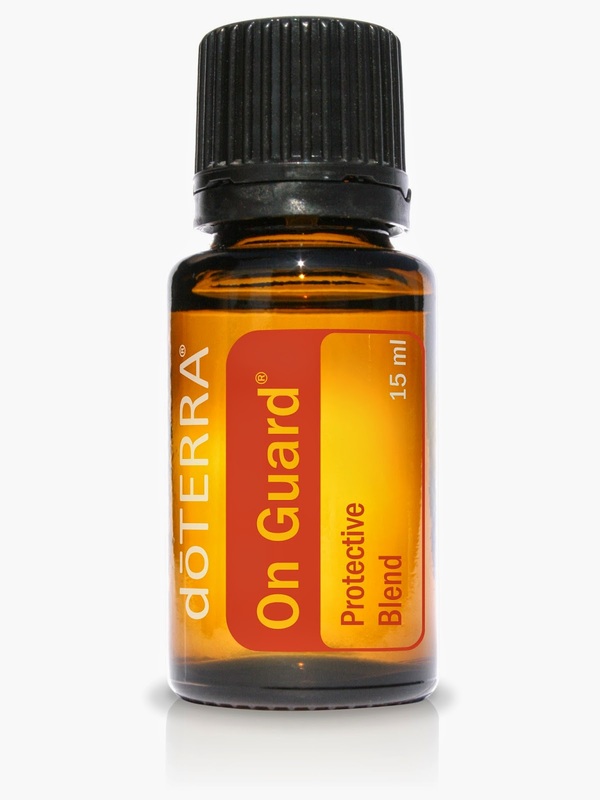 On Guard was my first purchase (along with Lemongrass, because my husband likes the smell!). As we were living in Dubai, and liquids cannot be imported, I sent the oils to my mum's in the UK. By the time we landed in the UK for a holiday and I got my hands on the oils, I was flagging. Gary had been away with work and I'd only gotten one full nights sleep in the last three weeks due to both kids getting sick and needing antibiotics, and then, obviously, I was struck down too. I first applied On Guard to my neck, and quickly regretted it. I have really sensitive skin and the On Guard burned like crazy! I didn't have any coconut oil handy to dilute it, so I settled for putting a drop on each of my big toes every morning after my shower. I decided to keep a record of my progress, so you can see the changes over the weeks. We've just returned from our holidays in the UK and I'm more shattered than before. My Two year old was so unsettled at being shoved in a travel cot, that she was awake several times a night. Not just awake, screaming like she'd had night terrors. Which woke my six month old who was sharing a room with her for the first time. Which woke both of us up, and we were passing in the corridor, picking up one child after the next and resettling them. I was shattered… but not ill. Despite the fact that both of the kids were on antibiotics for a sinus infection and an ear infection respectively. My body was so ready for the two full nights sleep we've had since we got back (my two year old was so happy to be back in her own cot that she refused both her milk and a story and was trying to climb the bars to scramble inside). And still there is no sickness. I can't yet decide if it's psychological, if the sickness bugs are just waiting to ambush me all at once, or if On Guard really is as good as it says it is. I'm going to continue to use it (and catch up on my sleep) and we'll see how we get on over the next few weeks/months. I'm very excited to try On Guard out on the kids, especially as my two year old is back to nursery tomorrow, but I'll have to wait a little while for the roller ball bottles (We are trying to be good and actually save some money, so I'm only buying oils and the accessories if there is enough room in the household budget). I want to make sure I am properly diluting them for their ages, definitely don't want to be burning their precious skin. In short, I'm still not sick. Despite the non sleeping continuing. I suspect my two year old has her final four molars itching to make an appearance, and my six month old is just baffling me. Is it reflux, is it teeth, who can really tell? Not even a sniffle. The humidity is still sitting at about 70% in Dubai at the moment and I'm sure that temperatures in the high 30's and low 40's are creating the perfect breeding ground for germs. My six month old is a little congested today, so I'm putting in an order for rollerball bottles so I can start using On Guard on the kids. I'd love it to make a difference to them. I don't really know what to say. Am I still just being lucky? It seems rather impossible, not to mention completely stupid, to suggest that essential oils are supporting my body so that it is fighting off the viruses that come calling, but I don't really have any other explanation. I still seem to be doing great. I had a hiccup at about 5 weeks in because I had my flu vaccine and then promptly caught a cold from my six month old. Although, usually one of the kids will be sick for about 5 days before I catch anything, but then it hits me hard. This time, I came down with a cold the first day, and it steered clear of my sinuses. It was much milder than usual and I definitely didn't have to take as much paracetamol or decongestant while it lasted. It didn't last very long either, about three days. I did increase the On Guard, applying it three times a day rather than once, while I was sick. I was a bit limited on the other essential oils I could use to help with it, as most of them are sitting in the UK waiting for my mum to come to visit. I used peppermint as a decongestant, applying it to my chest and then neat over the bridge of my nose. It was incredible, my nose was clear in about 30 seconds from applying it. I could still feel that I wasn't 100% but I could breathe. In short, On Guard is an essential oil I'm going to keep and apply daily. I've also decided to start applying it to both of the kids. I decided to go with a very weak dilution first, so I added 6 drops of On Guard to a 10ml glass bottle and then topped it up to the top with fractionated coconut oil. I'm pretty excited about using some of doTERRA's other oils and seeing if I have some more success. The Enigma of "Having it all"
The 21st Century Life - Waste not want not? Essential Oils - More than just a lovely smell?